Barefoot Angie Bee: Tropical Traditions and barefoot all day. Tropical Traditions and barefoot all day. How do my feet stay nice and soft even though I run barefoot? I get asked this often and I do two things. First I go barefoot. This in and of itself acts as a pumice stone and keeps my feet soft. Second, if my feet start feeling dry, I slather on Virgin Coconut oil and then put on a pair of thick Spa socks. Any kind of thick socks will do. You want socks that you don't mind getting oily and thick so it doesn't get on a smooth floor and make it all slickery. Its great to do this at night and just wear it to bed. Coconut oil is fantastic for any kind of skin and hair care. It's what I use instead of lotion and it smells like heaven! I put it around my eyes to combat wrinkles. Its fantastic for after shaving since I am prone to razor rash. The coconut oil keeps me from itching and breaking out. 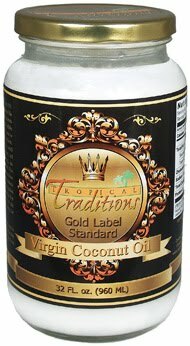 I usually buy the Spectrum brand Virgin Coconut oil but now I also use Tropical Traditions Gold Label. They were offering to send a 32 oz jar to bloggers to test out and then write what we think so of course I was up for that! I knew I already loved the stuff! When I checked out their website I discovered that they have a recipe page and the farming practices benefit the local people in the Philippine village where the coconuts are grown and harvested. The process of extracting the oil is an older one where the coconuts are used within 48 hours of picking. The meat is then grated and the milk squeezed out.The milk is left to sit and the oil naturally separates from the milk. There was such a high demand that Tropical Traditions couldn't keep up without changing their practices. Now hundreds of families in the area use the old tradition of making coconut oil. I like that I know where and who as well as how my products are being made. Its interesting as well as makes me feel connected to the rest of the world. Here is another website about the health benefits of coconut oil. Coconut oil is fantastic in any kind of curry dish and oh how I love it in chocolate! I melt unsweetened bakers chocolate and mix in brown sugar and coconut oil. Then either drop it right onto parchment paper or make Sunbutter cups or chocolate covered raisens, dates, strawberries. Anything is good chocolate covered! Just thought I would pass this on to you since its one of the things I use daily and really love. I have one more thing for you to try out. 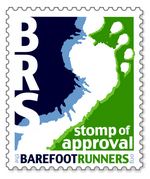 Many of you have expressed interest in giving barefoot running a try. It can be tricky to fit in if you are already training for a race coming up or just nervous. Its hard to try any thing that is new however however there is something you can do now. I suggest, especially now that the weather is warming up, to go barefoot as much as you can in your day to day life. If you work during the day, wear flat shoes instead of high heels. Maybe slip on some ballet flats at your desk or slip your shoes off altogether. There is always a way if you are creative! Its easy to slip some flip flops in your back pocket or backpack just in case you need shoes when you are out. Ever felt the smoothness of a grocery store floor or the mall or how about those cobblestones or bricks. Sitting at the library or coffee shop. You can slip off your shoes. Its far more acceptable now that its summer if you are worried about sordid looks. It will start to strengthen you feet and lengthen those tendons. It will give you a greater sense of connection with the earth. Yeah Yeah I know it sounds corney but it is true. There is nothing like walking barefoot and feeling warm soil or cool grass. For you gardeners out there, gardening barefoot will help keep away critters that might want to chew you plants. Famous gardener Tasha Tudor gardened barefoot. I must say, its much more fun! Don't forget to enter my CEP Compression sock giveaway! You definitely make it sound appealing! Thanks for sharing some tips & tricks. I love the photo of feet! 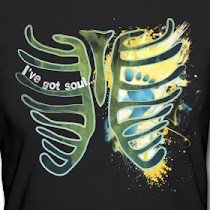 Did you take it. Amazing. I want to try out coconut oil sounds awesome! and I love being barefoot! I only where shoes if I am forced too....but I still have not tried running with out! I might have to give it a whirl. i am always looking for things to keep my feet soft! This sounds great! Thanks for the info! I love coconut oil and love how I smell after applying it. Now that there is so much in the news about carcinogenics in lotions, sunscreens and other cosmetics, this seems like an ideal product. That's a nice primer for people! I want to try the coconut oil--love that smell and it sounds wonderful as a moisturizer. I will have to try the coconut oil for my feet too. I love the smell of coconuts and if it will soften my feet...bonus:) I also liked the picture! I absolutely have no problem in saying that lathering my feet in coconut oil and putting on some spa socks would be awesome. I might have to watch Fight Club or something while I'm doing it to keep the universe in balance but then again maybe not. I LOVE being barefoot. The quote is awesome. Being barefoot and the feel of the wind are two of my favorite things. This was a great post. Thanks for all the info. I'd love to give barefoot running a try. 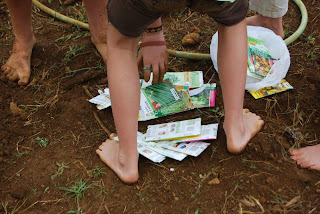 I never would have thought about gardening barefoot. That explains the really dirty feet I saw at school today; obviously, daughter was helping mom yesterday. I also use coconut oil on my foot to make it softer. I got mine from http://products.mercola.com/coconut-oil/ I apply it before I go to bed. It's really nice! Not that all, I also use it for my hair. Now, my hair's shinier that ever! I so love coconut oil!